Our meals are planned by the Director and staff, and are evaluated by the Health Department dietitian in order to ensure a balanced menu that meets your child’s daily nutritional requirements. Meals are prepared on site in the school kitchen. We serve breakfast and morning, afternoon, and late evening snacks. Lunch is brought from home so that the children may enjoy familiar foods midday. 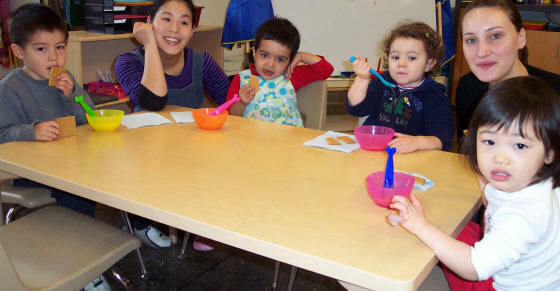 Northlake Preschool is a peanut-free, tree nut-free school. Due to life-threatening nut allergies for some of the children in our classrooms, we exclude peanuts, tree nuts (such as almonds or walnuts) and foods prepared with peanut products (including peanut oil) from our menus. Even minimal contact (with nut residue on a table, for instance) can have serious consequences. We ask that parents also observe this nut-free policy when packing school lunches. Thank you!